Today, human cannibalism occurs in a variety of contexts: for nutritional value (often in times of starvation), as part of funerary rituals or during warfare. The different purposes of cannibalism can leave different patterns in the archaeological record. When humans consume other humans for purely dietary reasons, the victims are often treated just like any other prey. This is what the researchers found at Gran Dolina. Eleven individuals were butchered in a manner similar to that of deer and other mammals: Bones had cut marks in areas of muscle attachments and the skulls had signs of defleshing. Thus, H. antecessor appeared to eat its own kind for a nutritional purpose—but probably not because of a food shortage, as the team says there’s evidence of cannibalism over an extended period of time, dozens or even hundreds of years. So why cannibalism? To find an answer, the researchers looked to chimpanzees. 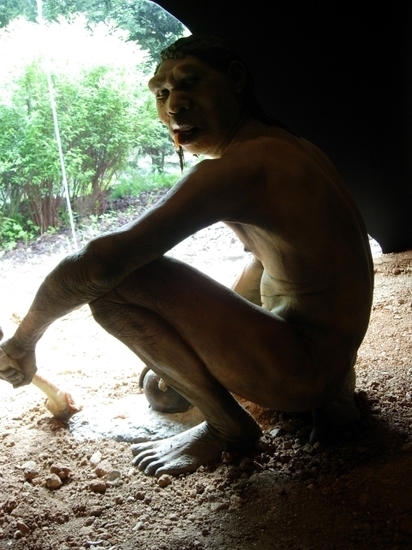 That’s because some aspects of H. antecessor cannibalism don’t resemble those of contemporary human cannibalism or cannibalism seen in Neanderthals or early modern humans living 100,000 years ago. For instance, nine of the 11 butchered individuals at Gran Dolina were children or adolescents compared with the largely adult victims of more recent human cannibalism. Young victims is a pattern seen among chimpanzees. When female chimps range alone near the boundary of their territory, males from the neighboring group may kill and eat the females’ infants. Carbonell and his colleagues suggest the best explanation for this behavior is territorial defense and expansion. Males may attack to scare off other chimps as a way to protect their resources and gain new land to roam; such attacks are easiest against vulnerable females and their young, which make good meals. The team likewise concludes a similar explanation may have been the motivation behind H. antecessor cannibalism. Whether this is a reasonable conclusion depends on some unanswered questions. For example, the researchers assume that the cannibalism was the result of intergroup violence and aggression, but they offer no evidence that the H. antecessor cannibals came from a different group than the victims. If they were all members of the same clan, then territorial defense doesn’t seem likely. It also seems unlikely if H. antecessor‘s social structure was vastly different from chimps—in which groups of probably related males band together to actively defend a territory while females in a community often forage alone with their infants. It looks like the team has some more work to do.